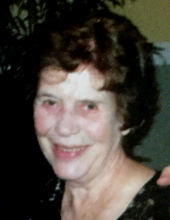 Kinderhook, NY — Jean Keogh, 86, died Thursday 16 August 2018 in Stafford, Virginia. She passed peacefully, while surrounded by family and friends. Jean has joined her husband Gerry, who died just months earlier. Jean leaves behind her daughter Carol Anderson and son-in-law Jay Anderson; her daughter Jean Palucci and son-in-law John Palucci; her son Tom Keogh and daughter-in-law Jill Keogh; eight grandchildren; two great grandchildren; her sisters Patricia (Pat) and Kathleen (Kitty), her brother Patrick (Paddy) and many close friends. Born in London, England and raised in Dunlavin, Ireland; the daughter of Thomas and Jenny Kirwan; Jean grew up in a small village where life centered around faith and family. Her father was a carpenter and her mother a dressmaker. Her parents taught her the importance of hard work, patience and kindness. She learned to bake and cook at an early age, a skill which benefitted all those who knew her. Her raisin scones and Irish soda bread were legendary. The kettle at her house was always on for friends and guests alike. All were welcomed in her kitchen with love and kindness. Jean left home at the age of 15 to begin work in Dublin. On weekends, she bicycled 30 miles on country roads to visit her family in Dunlavin. While living in Dublin, she met her soulmate and husband, Gerry. Jean and Gerry were married in St. Nicholas of Myra Church on June 3, 1957. Jean and Gerry devoted their entire lives to one another. Jean was the perfect complement to Gerry. After marrying in 1957, they emigrated from Ireland to Thunder Bay, Canada. In 1959 they immigrated to Long Island, New York via St. Louis. During that time, Jean raised her three children while Gerry worked for the New York City Metropolitan Transit Authority. In 1983 Jean and Gerry moved to Columbia County, NY, an area they both described as “God’s Country.” For over 33 years, Jean was an icon at the MacHayden Theater where she managed the box office and developed lifelong friendships. Jean was an amazing woman who brought out the best in everyone. Her concern for others was remarkable. She always had a kind word and smile, especially for children. There was no kinder or more caring person. Jean will be sorely missed. Calling hours will be held Friday, 24 August 2018 at French, Gifford, Preiter and Blasl Funeral Home in Chatham, NY from 5:00 to 8:00 pm. Mass will be at 10:00 am on Saturday, 25 August 2018 at St. John the Baptist Catholic Church in Valatie, NY. Interment will immediately follow the mass at St. John the Baptist Cemetery. A reception will follow at LaBella’s of Valatie at 12:00. All are welcome to help the Keoghs celebrate Jean’s life. In lieu of flowers, donations can be made to the MacHayden Theater (http://www.machaydntheatre.org/home/support/) in Jean’s name. Condolences may be conveyed at frenchblasl.com. To send flowers or a remembrance gift to the family of Jean Keogh, please visit our Tribute Store. "Email Address" would like to share the life celebration of Jean Keogh. Click on the "link" to go to share a favorite memory or leave a condolence message for the family.